Uluru is unique because it's a real-time multiplayer puzzler. In fact, it creates a new category of games! In Uluru, players must place their Bird counters on locations on a Personal Tray by following instructions on cards. Since each mistake is penalized, the players must think carefully by placing the pieces, but time is running out: a minute-long hourglass is flowing at a brisk pace! 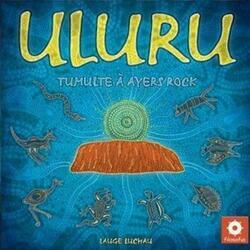 Uluru, a game to discover solo or with family!